I remember talking with my sister not too long ago about the story of Abraham and Isaac. There have been a few notable reflections on it in the past few years in pop culture, including the videogame The Binding of Isaac and the recent song Abraham’s Daughter. Why did Jesus die for me? Because he loves me. Why did Jesus die for me? Because I was bad and I deserved to die on that cross, not him. We – all who trust in Jesus’ promise that the cross has set us free from death – are all alike. We are the sinful firstborn of Abraham who was spared sacrificial death because God promised that the death of a lamb instead would suffice. We are the firstborn of faithless Israel in Egypt, spared fatal judgement because a firstborn passover lamb took our place. We are the convict Yeshua bar-Abbas, the sinful son of the father, spared from execution at the last minute because the firstborn son of the father who shares our name, Yeshua bar-Joseph, went to the cross in our place. 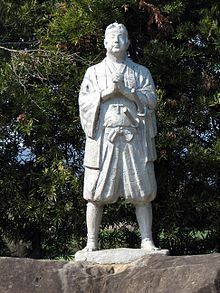 Meet Amakusa Shiro, the charismatic teenaged leader of the ill-fated Shimabara rebellion in Japan, which began in 1637 and was put down a year later.